As the west African countries trade with China is more and more closely, set off a huge Chinese trend in Africa. Local students, said learn Chinese could make them have more domestic employment advantages and Chinese market. Now China's economy enter into the world field become important participants, growing demand of Chinese learning around the world. Nowadays world cultural communication appears big boom, China has also increased the Chinese language promotion, set up 282 Confucius institutes and 272 Confucius classrooms in 88 countries, to help foreigners learn mandarin, feeling the unique charm of Chinese literature and culture. 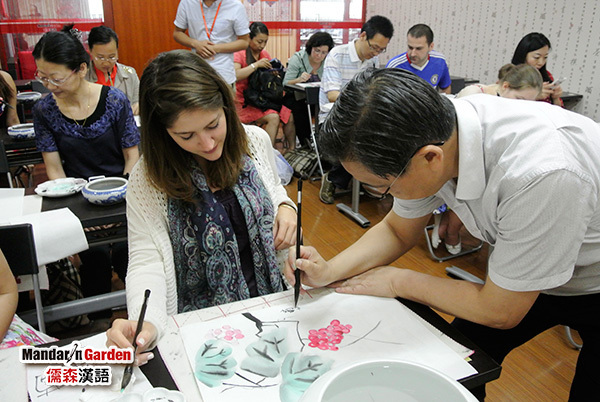 MandarinGarden teaches foreigners Chinese, and will be open for them some studies of Chinese ancient civilization interest-oriented class and literature lecture, to help them improve Chinese accomplishment. In Nigeria and other west African countries have a large number of immigrants from China, Chinese learning as the employment competitive power is relatively newness. Although Chinese is rated as one of the most difficult language to learn, but the students still want to know the Chinese culture here, at the same time to raise their competitiveness. For this they are willing to enter the local Confucius institute to learn Chinese. Under the extensive influence of Chinese economy and culture in the world, international friends to learn more about China and the demand of Chinese learning is also increasing, some schools in Italy Chinese more than English, French, Spanish, and other major western language, become the "first language". Next: Foreigners in MandarinGarden how to celebrate Christmas?